Dalyan is a beautiful little town located just a few kilometres from the Mediterranean coast of Turkey. Both the Mediterranean and Aegean coasts have long been visited by millions of tourists from Europe and Arab states thanks to its incredible weather, turquoise blue waters and stunning sandy beaches, but one holiday resort that should never be overlooked is the quiet riverside town of Dalyan. Over the past twenty years, the local economy in Dalyan has migrated from the agricultural business of citrus fruits, cotton and more recently pomegranates, to the exciting world of tourism while retaining its traditional Turkish charm, making it a top summer destination. It may well be the most beautiful beach in the world. In fact it quite often makes the top ten of many lists that feature the best beaches on the planet and it certainly tops ours! It is unique, it boasts incredible views of the Mediterranean in one direction and the mountains of Dalyan in the other. It is also home to the area’s precious loggerhead turtles, locally known as caretta caretta. 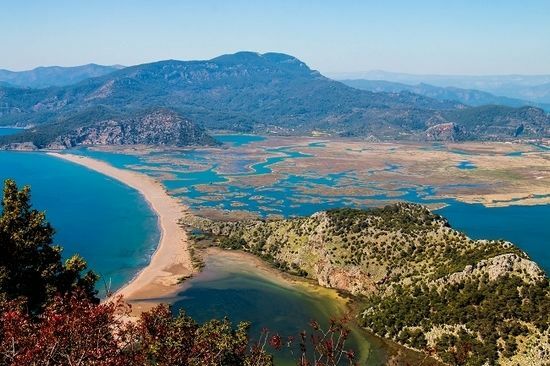 Iztuzu beach has long been the subject of controversy as hotel tycoons and developers have attempted to utilise the natural beauty of the area and build on the beach for monetary gain through Dalyan’s growing tourism trade. However, the power of the locals, led by one infamous Kaptan June Haimoff, has always won through in the end to keep Iztuzu beach as natural and unspoiled as possible, protecting the breeding ground and nesting area of the incredible turtles. This is a story of decades of work and dedication, a tale that can be discovered at Kaptan June’s hut which is located at the land side of the beach, just a short stroll from the warm sand. The journey to protect the loggerhead turtles began in the 1980s when June first discovered Dalyan herself and it is a battle that is still fought today, with corporate take over attempts occurring as recently as May 2016. June Haimoff may be in her 90s now, but she battles on tirelessly to protect the beloved caretta caretta, with the intention of making Iztuzu Beach a UNESCO World Heritage Site. Today, the glorious sandy spit of land is managed by Muğla University, which certainly offers it some extra protection. One favourite activity down at Iztuzu is to visit the University’s ‘Turtle Hospital’, a centre for rehabilitating turtles which have been injured by the propellors of passing boats, including those used by tourists. If you spend a day or two at the beach, be sure to visit the hospital and make a donation if you can. 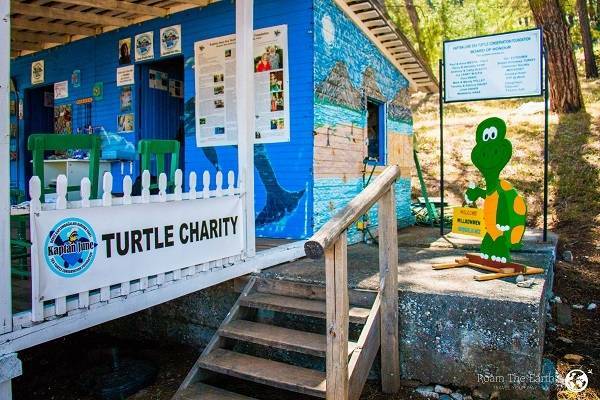 While June’s charity and the hospital are separate organisations, you would do well to choose a tourist boat that promotes the Kaptan June Foundation, as these most boats are most likely fitted with propellor guards which protect the turtles. There are two ways to get to Iztuzu beach, by road and by water. A local dolmuş does regular trips from Dalyan across the mountain and down ‘beach road’, dropping you between the sand and Kaptan June’s hut. Otherwise you could drive it yourself or cycle if you’re brave enough to embrace the steep climb over the hill! The most popular way to get to the beach is by water taxi, which leaves the centre of town, outside Kordon Restaurant, and takes you on a relaxing 20 minute boat ride through the reedy Dalyan delta with incredible views of the Lycian tombs. This route is highly recommended and you might even spot a few of the Nile turtles that live in the river! Dalyan attracts day-trippers from other popular Muğla resorts like Fethiye and Marmaris, not only for its stunning beach and caretta caretta, but for its natural thermal springs and mud baths. Popular since the Roman era when the springs were used as a spa and treatment facility, the sulphurous waters continue to attract hundreds of visitors every day. The springs measure at a temperature of 40 degrees celsius and seep out of a fault line crack. The water is mildly radioactive and rich in radon, sulphur, iron, calcium, potassium and a number of other minerals, making the health benefits second to none. The mud baths often produce a visual treat that liken it to scenes from ‘the Walking Dead’ as tourists smother themselves in the grey gloop and stand baking in the sun afterwards. It is quite a comedic experience, zombies aside, as you attempt to remain upright while entering and exiting the mud pools! However, the health benefits alone make this a worthwhile excursion. The mud is said to rejuvenate the skin while the thermal waters are recommended for anyone with skin complaints, arthritis, muscle fatigue and rheumatism. 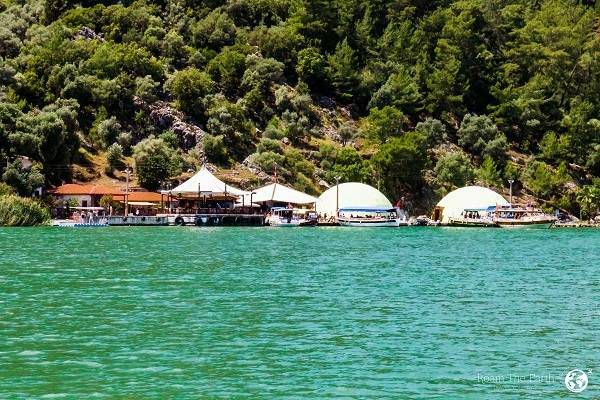 A couple of the hotels on the riverside in Dalyan offer their own versions of mud baths, but there are two that are more popular on Köyceğiz Lake, just a short boat ride from the centre of town. If you want the authentic experience, ask your boat captain to take you to Sultaniye Spa. It’s further away from Dalyan, but it is home to the original mud baths and the lake scenery is breathtakingly beautiful; it is well worth the extra time on the boat. 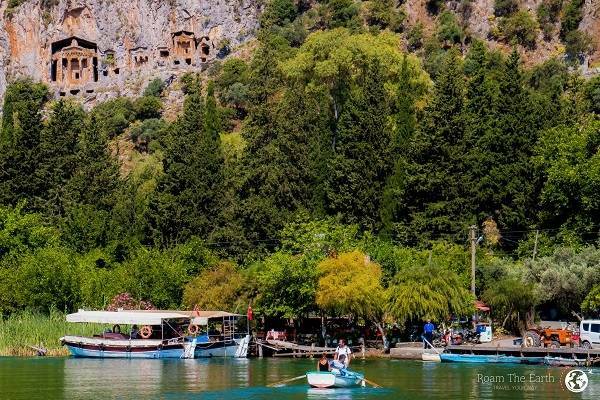 Dalyan is a town surrounded by water and no time in this town would be complete without exploring this! While the Dalyan river winds through the centre of town, you have the delta and Iztuzu Beach in one direction, and Köyceğiz Lake in the other. 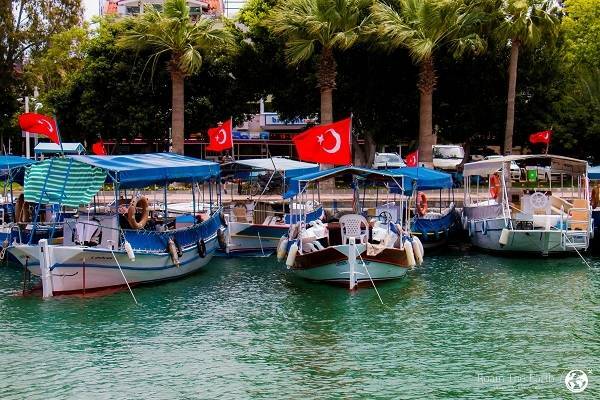 There are over 350 boats in Dalyan and you will not be short of boat trip offers as you walk along the river. Unless you want to get out of town for the day, this will be your number one thing to do in Dalyan. Boat trips will take you along the river, past the ancient city of Kaunos and the Lycian Tombs and through the delta to Iztuzu beach where you will have time to relax while your lunch is barbecued. Some captains will help you catch crabs for lunch or take you turtle spotting if you wish too. After lunch most boats will take you back through the delta and past Dalyan for a swimming and snorkelling in the vast lake. Next you will probably sail up to the mud baths for a healthy dip and right at the other end of the lake is the town of Köyceğiz which has a delightful market on a Monday. You might be interested to know that the original town of Köyceğiz actually lies beneath the water as it was destroyed by an earthquake hundreds of years ago. While this may sound like a diver’s delight, unfortunately exploring beneath the water is not allowed due to health and safety concerns and a decision to preserve the ruins. However, you could ask your captain to wander over in that direction and see if you can catch a glimpse of the old minaret that shoots up beneath the surface. 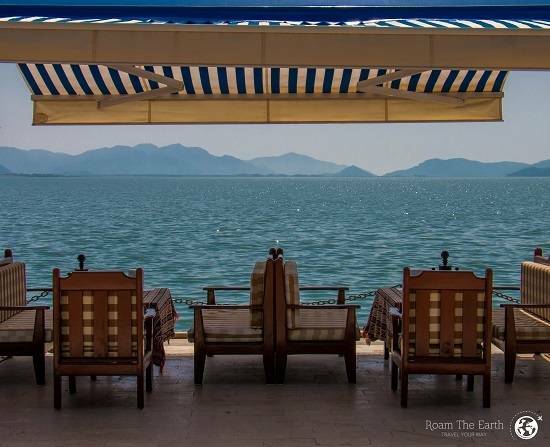 If you happen to visit Köyceğiz outside of market day, the town boasts a waterfront which gives you the most magnificent views of the lake which you can take advantage of over lunch. 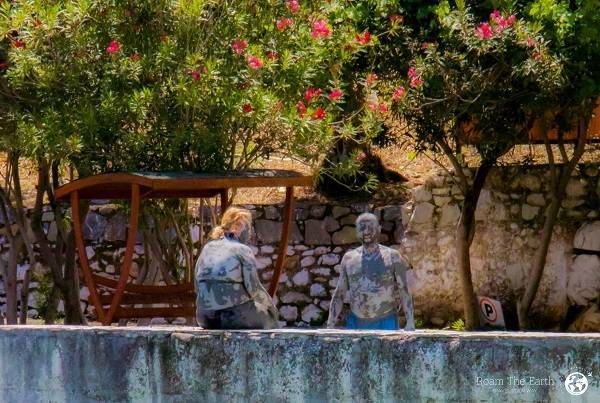 Like many areas of Turkey, local history is in abundance and Dalyan is no different. 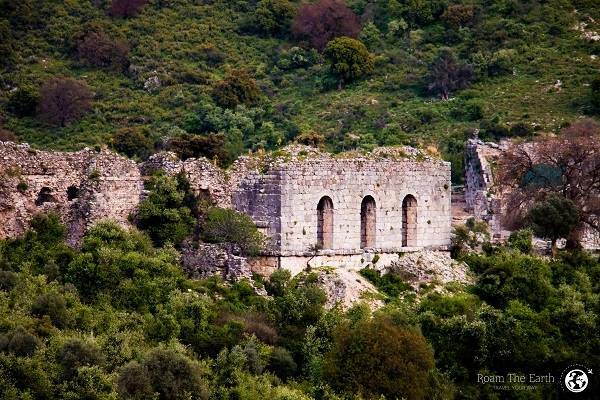 Dalyan’s prime site is the collection of ancient Lycian tombs which watch over the town. They are visible from the waterfront and are atmospherically lit up at night, but a trip across the river in a rowing boat will bring you ever closer to the Hellenistic temples. The Lycians chose to place their tombs in their cities close to their loved ones and they believed that the souls of the dead would be transported from the tombs to the afterlife by a winged siren-like creature. As a result, their tombs will always be found along the coast and at the top of the cliffs; Dalyan was indeed the perfect location. If you are brave enough, you can even climb up to and inside one or two! Where there is water there are mountains and this town has no shortage of the most amazing hiking trails which offer the most incredible views over the Dalyan vista. A trip across the water to the ancient city of Kaunos will give you the opportunity to climb up the hill to the Acropolis, which presents you will an unlimited view of the Mediterranean past the Dalyan delta. As you wind your way down the Dalyan river in either direction, you will spot a number of Turkish flags that sit proudly atop some rather large hills. Many of the hiking trails will not necessarily be marked out, but the flags prove that you are able to climb up there if you wish. The wonderful thing about Dalyan is that all of the mountains around the town are accessible and easy to get to. If you venture out towards the beach, be sure to ask the dolmuş driver to drop you at the bottom of Radar Hill. The road up to the radio transmitter tower is windy and not too steep until you reach the very top, but you would need a 4x4 or a day on the jeep safari to get up there otherwise. Once you are at the top, Radar Hill opens up to an incredible panoramic view of Iztuzu beach and the Dalyan delta. About half way up Radar Hill you will come to a fork in the road which offers you a trail to Sunset Restaurant which is highly recommended for delicious food and of course, an incredible view for one of the best sunsets in Turkey. Another great spot for hiking is Yuvarlakçay, a small settling up in the mountains a short drive from Dalyan. Being a little higher in altitude, the temperatures are lower providing a sometimes much needed respite from the Turkish summer heat. Around the area you can find some dense forested areas with fantastic wildlife and clear blue water streams and rivers sporting the occasional waterfall that are worth a dip in. If a more relaxing time is what you are looking for, there are a smattering of incredible fish restaurants up there too, with traditional Turkish style kösk seating areas that hover above the flowing river. Many of the establishments also have swings over the water and the staff will try and entice you to swing and jump in! 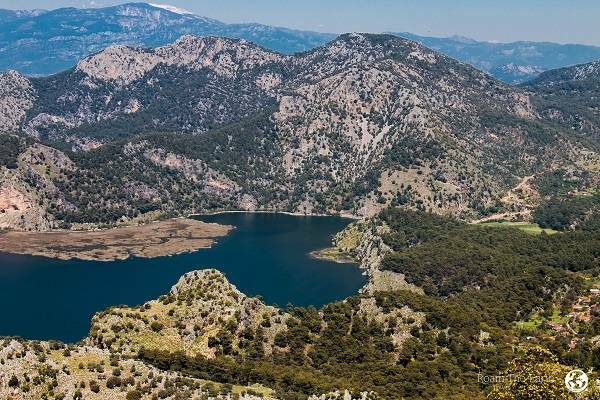 Most excitingly, Dalyan is also about to become home to one of the best hiking trails in the world thanks to a local initiative by local man Murat Demirci named the ‘Dalyan Eco Trail’. Hoping to be open and accessible by spring 2017, the Eco Trail will connect the Lycian way with the Caria Trail, both already centuries long established trails. Visitors will be able to walk or cycle the entire distance from Bodrum to Fethiye and beyond towards Antalya should they wish! Here, we have barely scratched the surface of what this wonderful area has to offer visitors from all over the world. All of our top five activities are accessible from Dalyan without a car, or even needing to leave the town at all! If you think this sounds like enough to fill a week’s holiday, perhaps consider staying longer and hiring a car, giving you the opportunity to explore the Muğla province some more! images by Roam the Earth.